A state of emergency has been declared in several countries in Central America, where Tropical Storm Nate is known to have killed over 20 people and caused havoc for thousands. 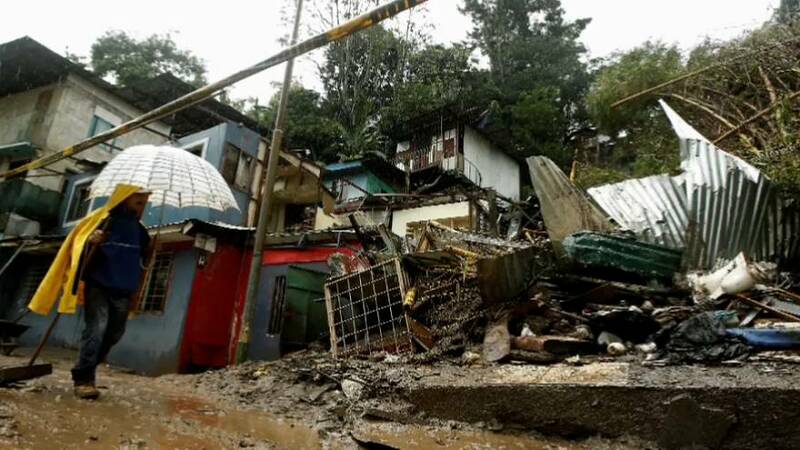 In Costa Rica the government declared a state of emergency as torrential rain brought mudslides and widespread flooding. The authorities said more than 7,000 people took refuge in shelters from the lashing rain. Hundreds of thousands are without running water. The storm also brought casualties as it swept through Nicaragua and Honduras. It’s forecast to hit Mexico’s Caribbean resorts on its way north, before striking the southern United States on Sunday. In Nicaragua, at least 11 people died, seven others were reported missing and thousands had to evacuate homes because of flooding, said the country’s vice-president Rosario Murillo. At least three people were killed in Honduras and several others were missing, sometimes as rivers swelled suddenly. Across this region in Central America, roads have been blocked and bridges destroyed, seriously disrupting transport. In Costa Rica, all train journeys were suspended and dozens of flights cancelled. Schools and all non-essential services were closed. If not actually destroyed, many buildings are threatened by the floods. Warnings have been issued not to try to cross rivers. Nicaragua’s vice-president Murillo went on the radio to warn people to avoid dangerous waters.